Why are 1 carat engagement rings so popular? What makes a 1 carat engagement ring any more special than any other engagement ring? There might not be very much to this but after selling thousands of engagement rings, Novori Jewelry has noticed that there is quite a demand for engagement rings that feature a 1 carat diamond or at least very close to it. In order to find the reason for it, you just have to look at a few examples of how diamonds are mined and what determines the value of a diamond. Once you get passed that, there is a big factor - although less scientific that plays a big part in the allure of a 1 carat diamond ring. Although we are talking here about a 1 carat diamond ring, it may be more accurate to base the discussion on a 1 carat diamond. It is the diamond after all that make the ring. The value of a diamond is largely based on the 4 C's of a diamond namely the cut, clarity, color and carat size of a diamond. When diamond are mined, the better a diamond is in any one of these characteristics, the more valuable it becomes and also the more rare it becomes. if you have a diamond that is a color D or colorless, the diamond is valued very high. However not many diamonds are mined with a color of D making them very rare hence increasing the value of the diamond. The same can be said for the carat size (measuring the weight) of a diamond. Larger diamond, say 2 carats, 3 carats or more are very rare to mine and are very expensive. The 1 carat diamond, it at a point where it is still affordable because it is not that rare. If you are looking for a cheap 1 carat engagement ring (we mean inexpensive when we say that) there is something you should know. If you purchase a ring setting that features side stones, the side stones may be 1/2 carat diamonds. That makes the ring 1/2 carats already! All you need to do is add a 1/2 carat center stone and the total carat weight of the ring will be a 1 carat engagement ring. 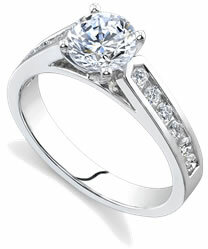 If you want to purchase a smaller center diamond but still have a 1 carat ring, simply select a ring with side stones. When you add all the diamonds together, you can say it is a 1 carat ring! Online engagement ring sales at sites like Novori.com are growing every year. People are finding that the place to find the best quality diamonds with guaranteed low prices and rings at the best prices are online. At Novori Jewelry, we are an online jeweler and we pass the savings of low overhead on diamonds and rings directly to you. We even offer a lowest price guarantee for Novori diamonds. Finding a 1 carat engagement ring is not difficult to do. Almost all of the wedding rings on the Novori web site will accommodate a 1 carat diamond. The diamonds sold at Novori are pre selected for quality. For examples, we do not sell any diamonds that have a color rating of less than J because the color J is the lowest rating in the 'near colorless' range. Once you go below that chances are you will not be pleased with the color of the diamond. We just don't list these diamonds on our site. The same is true for inferior cut grades and clarity grades. You won't find poor quality diamonds on our web site. The best 1 carat engagement ring is generally going to be the perfect designer engagement ring matched with your selected 1 carat diamond. You will not believe how great these rings look until you hold it in your hand. You won't believe how low the price is until you order one! If you need help selecting the diamond, our jewelry experts are here to assist you. You can use live chat or call us toll free at 1-877-877-4141. 1 Carat Diamond Rings The Answer? It's pretty safe to say that a 1 carat engagement ring will not make you any more happier or more secure in your engagement or marriage. It will not ensure marital bliss or faithfulness. Why then is there such a demand for a 1 carat diamond ring? It may just be that a 1 carat diamond is within the upper budget range of most couples getting engaged. There are always cheaper diamonds - Novori has tens of thousands of certified diamonds listed on their web site - but you always want to get the best possible for your loved one. The 1 carat diamond is priced so that most couples can afford to purchase it. It might just be a nice round number that everyone can relate to and identify with. In any case a 1 carat diamond engagement ring is a nice ring. You can find yours today at Novori Jewelry.